Yet, even though the “What Pub Next?” Club was officially disbanded a couple of years ago – even though there are only a handful of members left alive – even though there are no new members, no junior members, only senior members in their eighties and nineties – even though they no longer stray to any other pubs, adopting Simpsons Chop House (thirty seven and a half, Cornhill) as their headquarters – even though the question “What Pub Next?” is no longer asked – such is the intoxicating nature of this fellowship, these rebel diehards continue to put on their club ties and gather for old time’s sake. Escaping the icy gusts in Cornhill, I walked through Ball Court and discovered the eighteenth century edifice of Simpsons looming overhead, then I climbed down a windy stair to join the members of the “What Pub Next?” Club, who were merrily clinking tankards and celebrating as if Christmas had come already. So pervasive was the sense of mischief and fun, that whilst I could enjoy the experience offered by the “What Pub Next?” Club at once, appreciating the exact the nature of the organisation proved to be more elusive. Several original members squinted and strained when I asked them if they could remember when they first came along or if they could recall how it started. The genesis of the “What Pub Next?” Club is lost, it seems, in a haze of conviviality. “I’m not sure anyone knows when it began,” queried ninety-one-year-old Douglas, whose daughters had dropped him off while they did their Christmas shopping. “It had to be a Bass pub, they had to serve draft beer,” interposed his friend “Ginger” helpfully, gesticulating with a sausage. 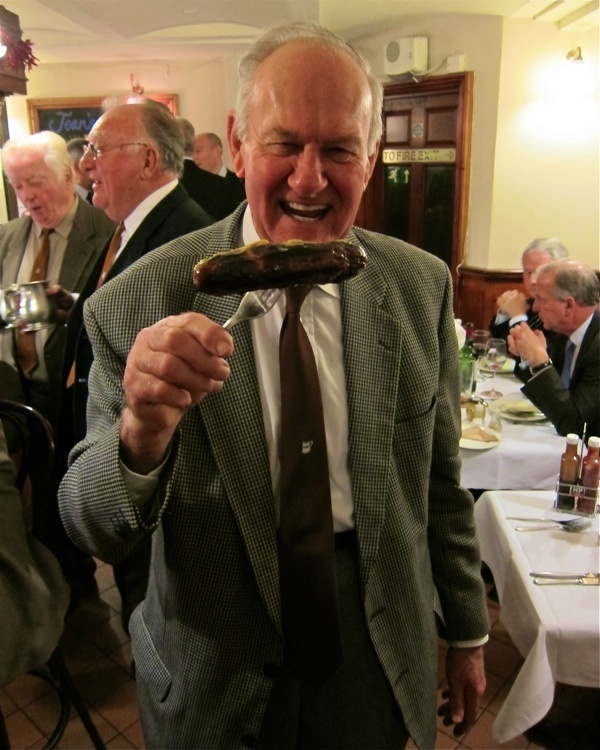 “And we had to drink a spoonful of Worcestershire sauce as an initiation,” contributed Brian with a chuckle. “By Jingo, let us have what we are here for!” exclaimed Pat authoritatively, the most senior member at ninety-two, reaching out for a mustard smothered sausage on a stick.“I know everyone here but don’t for a minute think that I can recall their names,” he informed me, “because somewhere along the way, I lost my memory – I can remember their name as long as as it’s Brian.” A comment which was the catalyst for general hilarity. “I only come here to make your lives happier, I don’t enjoy it,” he continued, adopting a stern tone, waving his hands around and asking rhetorically, “Can you enjoy life without laughing? Life’s far too serious not to be taken lightly.” It was a maxim that could easily be the Club motto. 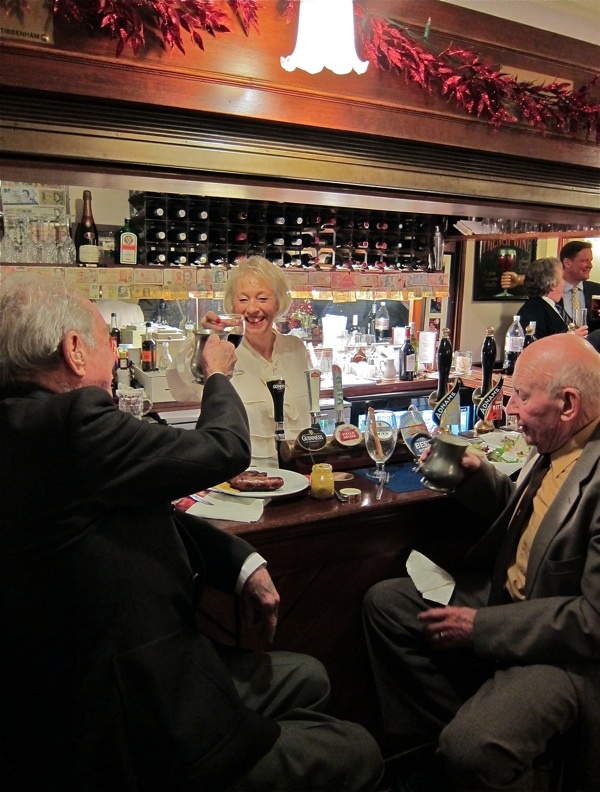 Originating among employees of the Australia & New Zealand Bank who wanted to learn about British culture whilst posted to London before they returned to the antipodes, the “What Pub Next?” Club quickly became a social focus for hundreds of City workers in the nineteen-sixties. 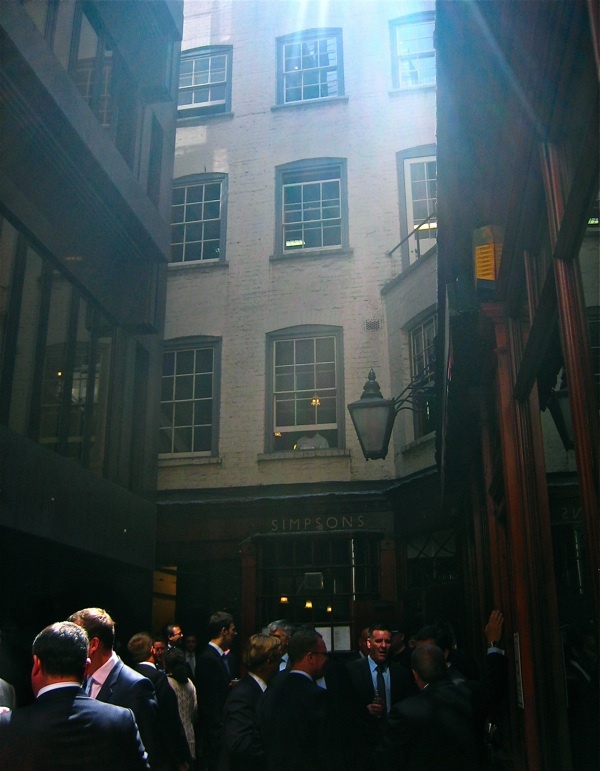 All that was required for membership was a tie – a tie that was ceremonially cut off with giant shears belonging to Mr True, the tailor at the Bell in Cannon St, if members left to return to their country of origin. These stumps of ties were nailed to wall in the cellar of Simpsons along with pairs of knickers acquired by undisclosed means, I was assured. A fact that was the cue to recall Sid Cumberland, who had his little finger cut off by mistake during the tie ceremony – though fortunately the surgeons at Barts were able to sew it on again and Sid returned safely to New Zealand with only a crooked digit as evidence of his misadventures in London. 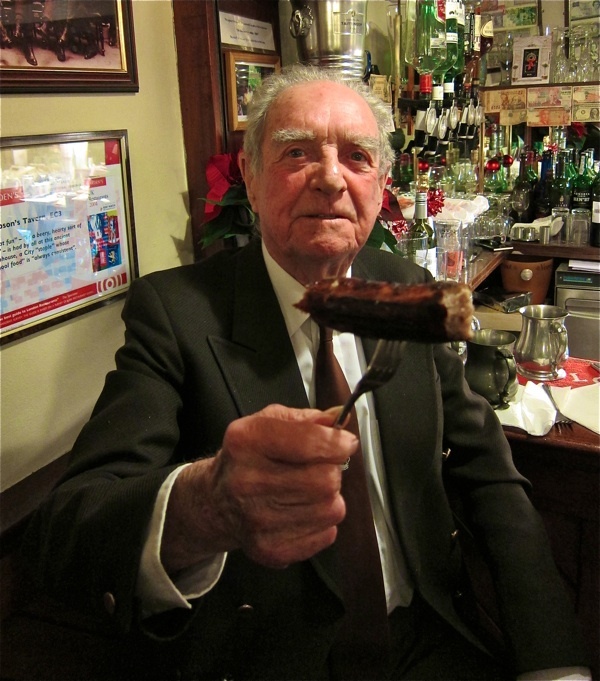 The late Ken Wickes is commemorated as president and founder of the “What Pub Next?” Club by a brass plate over the bar. “Every year he resigned and every year he was re-elected,” they told me affectionately. By now, the port was being passed around in a pewter tankard and – with so few members of the Club left – it was circulating like a horse on a merry-go-round. As a consequence, the momentum and eloquence of the conversation accelerated too, so that the story of the WPNC trip to the Bass brewery and the account of the WPNC Morris dancing on the banks of the Stour passed me by. Yet I had grasped enough of an impression of the glorious history of the noble Club, enough to understand why they should all wish to keep meeting and celebrating for ever. The WPN club tie with its discreet logo is de rigeur on these occasions. 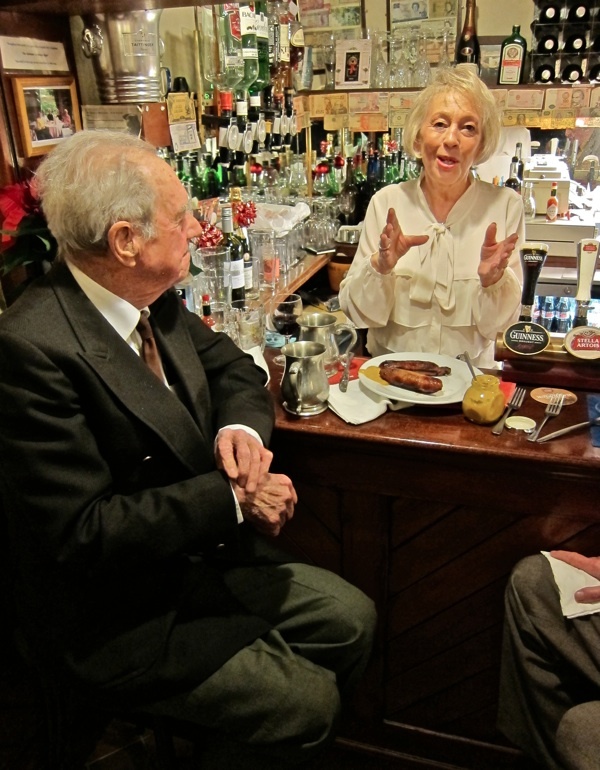 Jean Churcher, the celebrated raconteuse of Simpsons Chop House. 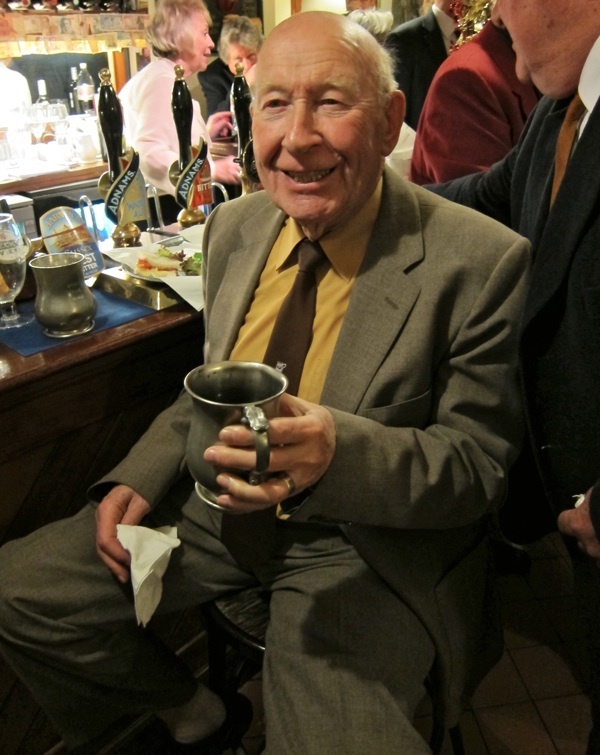 Quaffing the Port from a pewter tankard. 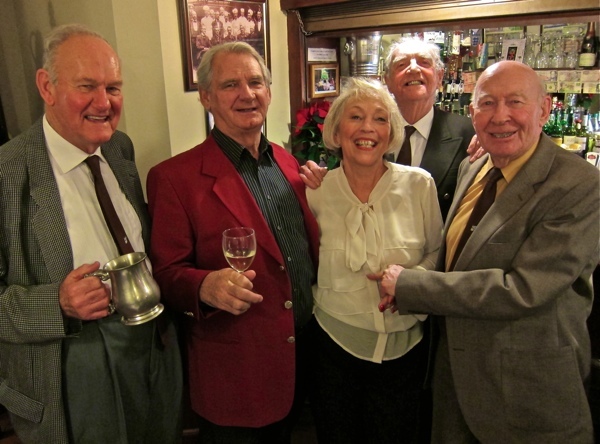 Happy Christmas from the members of the “What Pub Next?” Club! 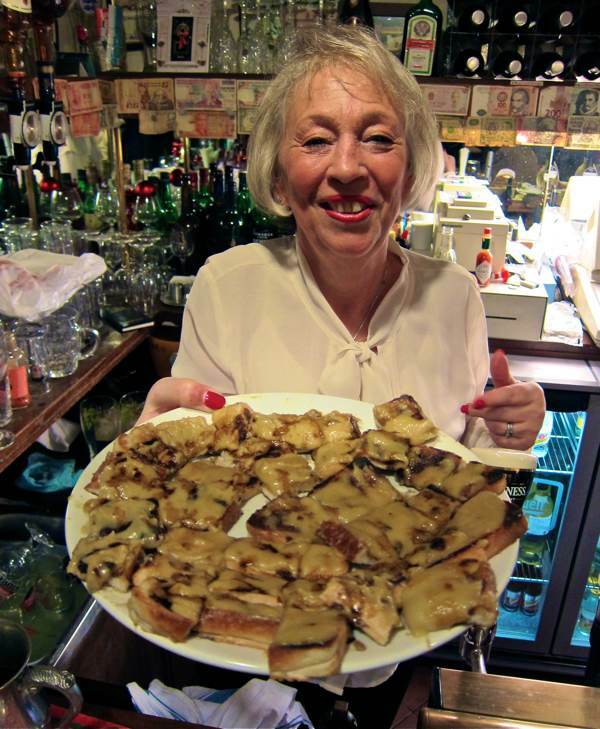 Cheese on toast with Worcestershire Sauce is the traditional conclusion of proceedings at the WPN Club. Whilst working at Daiwa Bank in King William Street in the late 1990s , my manager took me to lunch at Simpsons , the place is a legend. The salmon wasn’t bad either. Cheers and sausages. How delightful. I really must make it to your blog workshop if only for the meeting. What a splendid article. I write as one of the sons of Sid Cumberland (ibid.). 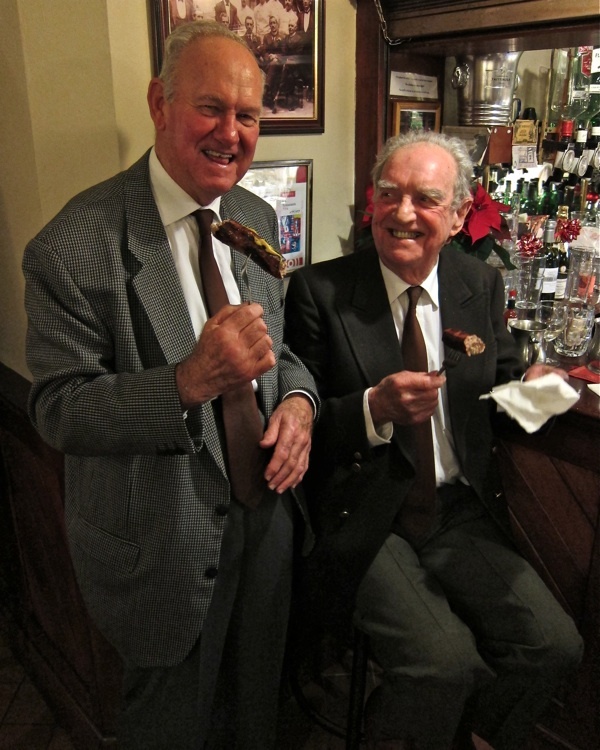 It is true that Sid was a stalwart of the WPNC for many years. His little finger was not quite severed in the incident referred to, but it was a deep cut. If I remember rightly, a somewhat jollity-impaired Australian pal attempted light-hearted revenge on Sid with the shears that night, and Sid was wounded protecting his own tie. He, of course, was not returning down under, and as an Englishman resident here retained full rights to the sacred neckwear. Thanks for the memories.